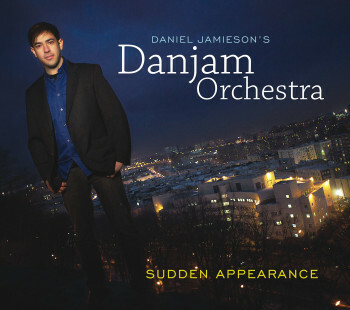 The Danjam Orchestra’s debut recording. Released May 17th, 2011. Toronto bred and New York based composer/arranger/saxophonist Daniel Jamieson presents the debut recording of his big band, The Danjam Orchestra. Inspired first by home-town heroes, Rob McConnell’s Boss Brass, Jamieson later was exposed to the works of Dave Liebman, Jim McNeely (who produced this session), and others while furthering his studies at the Manhattan School of Music. Featuring the great drumming of John Riley and a program of inspired original compositions, the band also performs a lush and swinging arrangement of Charlie Chaplin’s Smile, and a darting, dissonant treatment of Alone Together. All music composed & arranged by Daniel Jamieson (SOCAN), except: Alone Together, composed by Howard Dietz & Arthur Schwartz, and Smile, composed by Charlie Chaplin. A big thank you to those whose generous gifts made this CD possible. Additional thanks to Paul & Brenda Jamieson, Alex Dean, Dave Liebman, Pablo Masis, Rob McConnell, Steve McFarlane, Jim McNeely, Dave Neill, John Pagnotta, P.J. Perry, Terry Promane, Paul Read, Tim Ries, & Caitlin Smith.